High-resolution connectomics data allows for the identification of dysfunctional mitochondria which are linked to a variety of diseases such as autism or bipolar. However, manual analysis is not feasible since datasets can be petabytes in size. We present a fully automatic mitochondria detector based on a modified U-Net architecture that yields high accuracy and fast processing times. We evaluate our method on multiple real-world connectomics datasets, including an improved version of the EPFL mitochondria benchmark. Our results show a Jaccard index of up to 0.90 with inference times lower than 16ms for a 512 x 512px image tile. This speed is faster than the acquisition speed of modern electron microscopes, enabling mitochondria detection in real-time. Compared to previous work, our detector ranks first for real-time detection and can be used for image alignment. Our data, results, and code are freely available. 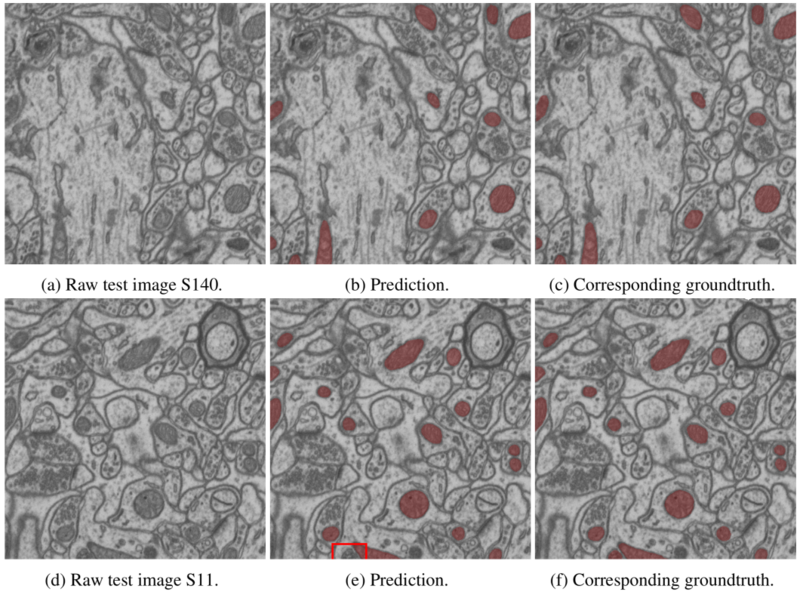 The segmentation of mitochondria during image acquisition is possible. Our end-to-end detector uses 2D images and automatically produces accurate segmentation masks of high quality in real-time. This is important as connectomics datasets approach petabytes in size. By predicting mitochondria in 2D, parallelization is as trivial as processing sections individually which can further increase throughput. We also confirm previously reported inconsistencies in publicly available segmentation datasets of mitochondria and fix the shortcomings in two available ground truth annotations. We provide the datasets and our code as free and open research in order to facilitate further research. For instance, 2D mitochondria detection could generate additional features to improve robustness of image alignment procedures. 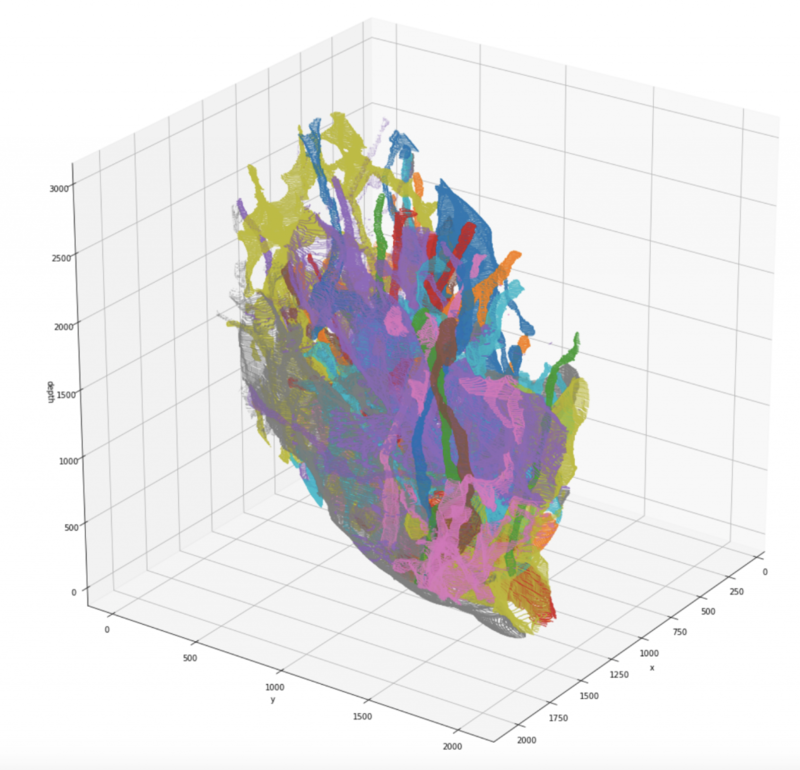 As a proof-of-concept, we perform 3D alignment with detected mitochondria. Inspired by spatial transformer networks, we learn the 3D registration of connectomics image slices. We train a DenseNet121 network with custom layers that apply affine and elastic transformations to two neighboring and mis-aligned image slices (fully differentiable, executed on GPU). This allows us to directly regress transformation parameters, and to sample randomly generated synthetic data. For affine transformations, connecting our detector reduces the prediction mean-square-error by 27.01% (2.24%), from 14.097 (4.328) to 11.099 (4.233). Qualitative Results on the EPFL Hippocampus Dataset. Notice mistakes on the bottom in (e), where parts of mitochondria are missing (FN), and in the bottom right in (h), where the detector shows minor spurious detections (FP). We show raw output here, both mistakes are at least partially corrected with simple post-processing (Z-filtering). Performance Comparison on the EPFL Hippocampus Data. We compare our classifier to previously published methods. We report performance as Jaccard and VOC scores, ordered by Jaccard (the higher, the better). If not reported in their respective papers, we infer lower bound Jaccard scores from other scores as indicated by +. Mitochondria Detection Results. 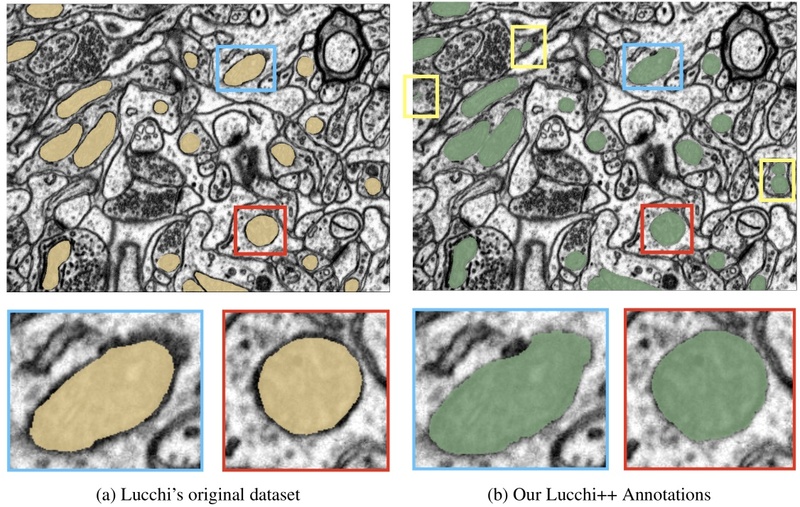 We show the performance of our mitochondria detector in 2D and with Z-filtering on Lucchi’s original Hippocampus dataset, our re-annotated Lucchi++ dataset, and on the new Kasthuri++ dataset. We report testing accuracy, precision and recall including area-under-the-curve, the Jaccard index (often referred to as Intersect-over-Union), and the VOC- Score. The higher the scores, the better. Post processing in terms of Z-filtering is able to slightly increase performance but does not require full 3D stack information. Developed Software. (a) An application to perform real-time mitochondria detection using a client/server framework. (b) Our annotation framework that lets users proofread individual mitochondria labels. This dataset is based on the EPFL Hippocampus dataset, as published in Structured Image Segmentation using Kernelized Features by Lucchi et al . Our experts re-annotated the two EPFL Hippocampus stacks. Our goal was to achieve consistency for all mitochondria membrane annotations and to correct any misclassifications in the ground truth labelings. First, a senior biologist manually corrected mitochondria membrane labelings using an in-house annotation software. For validation, two neuroscientists were then asked to separately proofread the labelings to judge membrane consistency. We then compared these expert judgments. In cases of disagreement between the neuroscientists, the biologist corrected the annotations until consensus between them was reached. The biologist annotated very precisely and only a handful of membranes had to be corrected after proofreading. To fix misclassifications, our biologist manually looked at every image slice of the two Hippocampus stacks for missing and wrongly labeled mitochondria. The resulting corrections were then again proofread by two neuroscientists until agreement was reached. In several cases it was only possible to identify structures as partial mitochondria by looking at previous sections in the image stacks. The New Lucchi++ Mitochondria Benchmark Dataset. 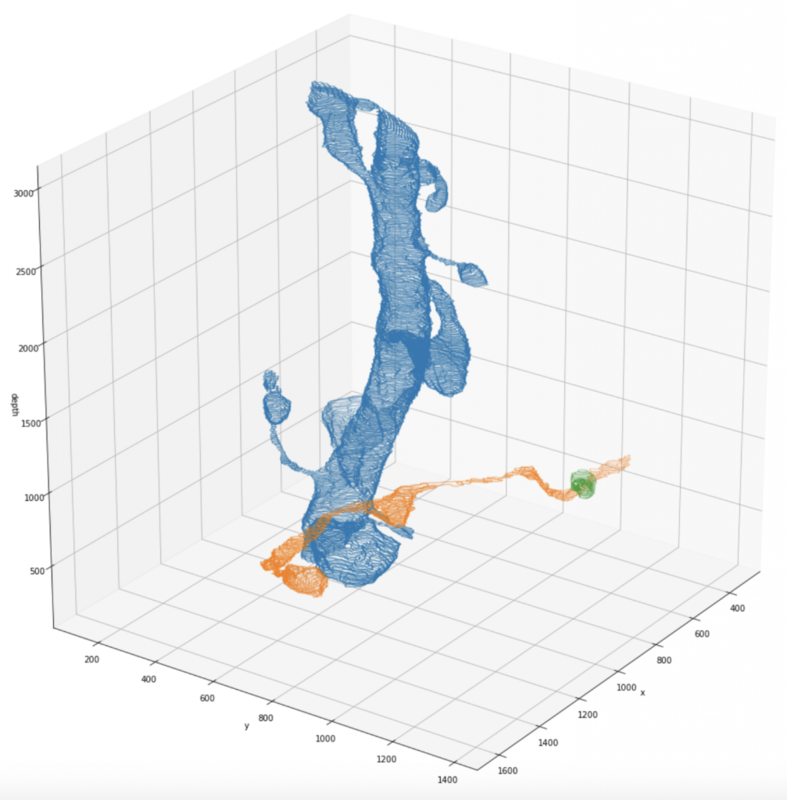 Left: Lucchi et al.’s original EPFL Hippocampus mitochondria segmentation benchmark dataset. Right: Our neuroscientists re-annotate the original dataset to counter mitochondria boundary inconsistencies (examples in blue and red) and to correct misclassifications (yellow). We use the mitochondria annotations of the 3-cylinder mouse cortex volume of Kasthuri et al. The tissue is dense mammalian neuropil from layers 4 and 5 of the S1 primary somatosensory cortex, acquired using serial section electron microscopy (ssEM). Similar to Lucchi’s Hippocampus dataset, we noticed membrane inconsistencies within the mitochondria segmentation masks in this data. We asked our experts to correct these shortcomings through re-annotation of two neighboring sub-volumes leveraging the same process described above for the Lucchi++ dataset. The stack dimensions are 1463 × 1613 × 85vx and 1334 × 1553 × 75vx with a resolution of 3 × 3 × 30nm per voxel. The download includes the raw images, the segmentation maps, the two cylinder outlines as binary masks, and the pre-computed dictionaries for efficient querying.